I bought these a few years back and have enjoyed the new found real estate on my desk. I have upgraded to two 27″ monitors, and this still works well. They wont sit well stacked due to the monitors hitting each other, but if you were able to find a better pole/stand, you could do it with ease. Currently my two monitor setup is one vertical, one horizontal which suits my needs pretty well. Having both horizontal is a bit difficult due to the length of the arms. 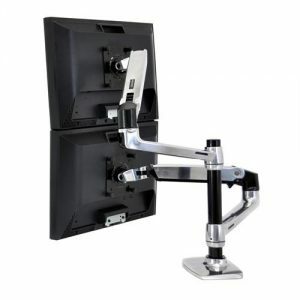 Ergotron should offer arm extenders to allow the 27″ or larger screens, and they may in the future. 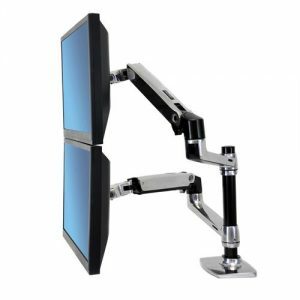 These are great monitor stands. 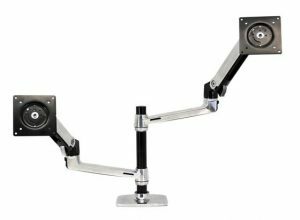 Ergotron should offer more stands that work with larger monitors, or offer adapters to use them properly.